As a general rule, any beverage that can stain a white shirt can also stain your teeth. Coffee, cola, tea, red wine, and brightly colored fruit juices are all culprits. To protect your smile, limit your intake of these beverages. When you do indulge, rinse your mouth with water as soon as you’re finished. Did you know that your lipstick can be a tooth whitening tool? If your teeth look yellow, choose lip colors with blue or pink undertones. Examples include wine, berry, plum, and cherry red. A critical element in any tooth whitening plan is great hygiene. Brush your teeth twice a day and after every meal when possible. Floss every day, and use an antibacterial mouth rinse to fight plaque. Be sure to replace your toothbrush every three or four months. 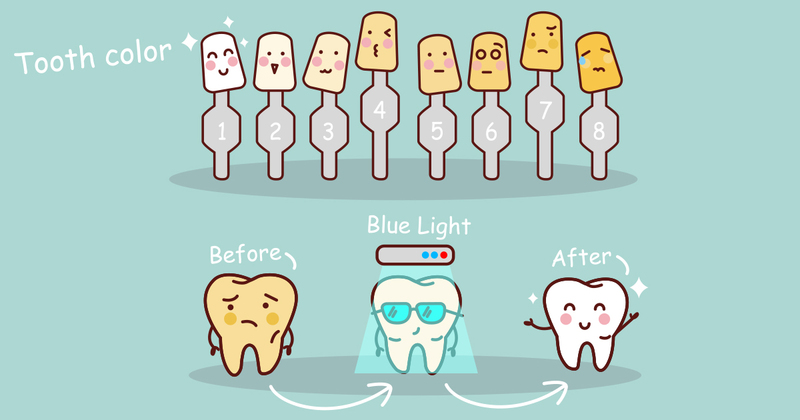 If a small imperfection is bugging you, ask your dentist about dental bonding. The process involves applying a tooth-colored resin to a crack, gap, or unsightly stain and then hardening it under a special laser. Your new bonded tooth will look natural and give you a new reason to smile. When teeth bleaching isn’t enough, porcelain veneers are the perfect answer. They’re custom designed to fit your teeth, and they can hide a multitude of minor problems such as yellow stains, uneven or misshapen areas, and small chips. You’ll need to attend two dental visits for the process, but your veneers will last for years. Professional teeth whitening or teeth bleaching is the quickest way to remove stains and whiten natural teeth. Your dentist will brush a peroxide gel over your teeth and then activate it with a special light or laser. The results are instant, and with good care, you could have a brighter smile for up to a year.